Alexandre Hannesse signs his works as "Gothlieb Tjiackk". Born in Brussels in 1970, where he lives and works. Always tempted by photography in particular by portraits, Alexandre Hannesse worked in the nineties as an assistant photographer focused on black & white portraits. He'll follow this influence all his life as an artist. At the end of the nineties he'll take the liberty to participate in some small competition-exhibitions which ended in great trophies. 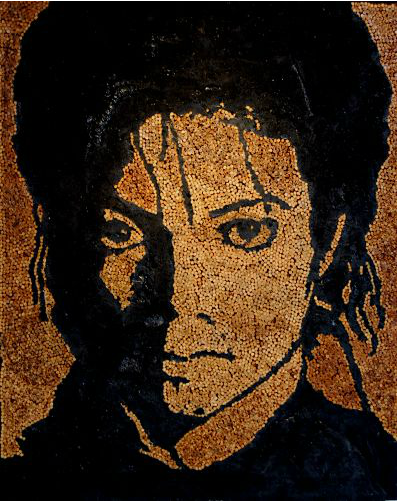 In 2000 he decides to go to Portugal and work together with another artist in order to study once more the art of the portrait. He'll do this a year long. In 2006 supported by his sensibility and his keen eye on the world around him, Alexandre Hannesse decides to create "Gothlieb Tjiackk" an imaginary artist, issued out of a fusion between art and evil. He then developed "Nocif'Art", an artistic creation resulting from a sick community, its ideas and its products but also its immoderate overconsumption by people. Today MoW selected 5 of your artworks inspired by music. Can you tell MoW how music inspired them ? What was the music behind the artworks ? What inspired you to create them ? Mostly french music, pop, grunge and jazz. « La Vie En Rose » inspired me to create a portait of Edith Piaf. The album « Tutu » for Miles Davis. « Thriller » is definitely a huge inspiration and « Smell Like Teen Spirit » for Kurt Cobain. Indeed music has an important place in my life. It’s impossible for me to leave without music. There is clearly a link between my art and music. Fusioning the "Nocivity" and the music hasn’t been done hasardly. All the personalities have been hurt by drugs, alcool or even died from abuses. Also, I think that the cigaret gives a « live » addition to his nocif nature. Can you tell MoW more about the techniques you used. How old is your technique? How did it start? How long does it take you to make an artwork? It is hard to say, I could work simultaneously on two different pieces. In average, it takes me 200 hours for one piece, but all depends on the number of butts I use, cause first I need to find them. They come from bars, terrasses where bartenders kindly keep them for me in plastic bags. Then I peel the butts (dirtiest part of the work), when I say « peel » it means to keep only the filter. Imagine that for a piece on Hendrix it took me about 10 000 butts ! The butts are bonded to the same footprint, made beforehand. Once adhered to the light areas of the drawing, a layer of polyurethane foam is then applied to cover the rest of the space, it is cut and painted with black acrylic in order to bring out the shadows. Treated with polyester and sealer to get them hard, the butts are then confined for eternity! The frames (I made them myself) also have a musical touch as it is performed with vynil records, I found it really found to do. Do you have plans on creating new artworks inspired by music ? The next piece... probably inspired by Keith Richards, between him and cigarets it is more than a fusion, but a real love story. What is the song you liked the most lately? The album ? What was the last gig you went to ? The song I like the most lately (even if it’s pretty old) was « Give It Up Or Turn It a Loose » by James Brown. Are you a musician yourself ? If so can you tell MoW more about your music projects ? Yes ! I played drums for 5 years, but only for jamming ! It was the good old time and I loved playing drums. And when I have the chance to go to a concert and see a live drum solo it always make me vibrate. But now I found myself in art much more quiet but that makes me still vibrated.